My Size 64mm are the second-largest condoms in the world. If you’ve tried the Trojan Magnum XL and the condom was too tight around the base, the My Size condom may fit the bill. 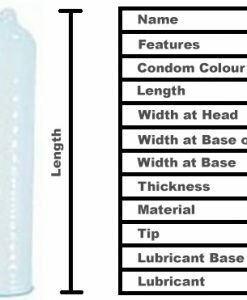 The 64mm condom is longer and wider than the Magnum XL, allowing the larger gentleman much more comfort and greater sensations. Check our special sizing chart. Men across the U.K. consistently give My Size’s condoms top marks for their custom fit. All My Size condoms are transparent latex, lubricated with a reservoir end. They offer plenty of sensation and users say that be wearing a condom that fits allows them to feel more natural warmth from their partners. When they wore condoms that were too tight or too short, they worried constantly about breakage or the condom slipping off. This is never a concern with My Size 64mm condoms.